I got the borders made and sewn on the third Smoky Mountain piece (there will be a tutorial about this process coming up soon). It was on my design wall for a few days hanging with the first two along with my reference photo. While sorting the heap of scraps on my studio floor into separate bags ... one for lake quilts, another for future mountain pieces, plus a pile of the larger pieces for scrap blocks to make charity quilts ...I studied and compared. I couldn't leave it alone! Each day I was less enamored with just letting the fabric tell the whole story. Compared to the first two versions it was looking like a "paint by number" piece. I just had to get out the oil stick pastels and watercolor pencils to shade hard edges and add fall colors to the trees in the mountains. Who knows? I may not be finished with touching it up yet. Okay, this is the result that I had in mind. The fabrics are speaking loud and clear and telling the story. A bit of oil stick pastel work shades the distant "orange" mountain and I drew in a few more tree trunks in the foreground stand of trees. Now, if I can just leave it be. This is how it looked before the free-motion machine quilting defined the areas. I used clear mono-filament thread for the clouds, a smoke one for the foreground stand of trees and the furthermost mountains. Two different variegated King Tut #40 threads are zig-zagged on the middle range mountains. ...and here are the fabrics that form the foundation of the scene before bits and pieces plus wool roving were added for finer details. Now, who would've dreamed that the flip-flop shoe batik fabric would become trees. It's amazing what can be "seen" when digging through heaps of scraps. I can't believe these bags contain so few green scraps. Next is making the border for this piece. I'll photograph the steps for a tutorial in the next post. A guest here at the cottage who has hiked a lot in the Smoky Mountains recognized this spot. It's the Sugarlands Overlook. I'm pleased that she recognized it from the quilt before seeing the photo. I made another small quilt of that same scene. This time I'll take you backwards in my process. The finished piece has a lot added ... oil stick pastels, watercolor pencils, watercolor crayons, paint, and permanent marker. My intention was to let the fabrics and stitching speak, but that's not how it worked out. Now that it's too late, I wish I had stopped nearer to this point ... just after the machine free-motion quilting was finished. A few sunny highlights plus drawing a suggestion of trunks and branches in the foreground trees may have done it. This is how it looked with the tulle overlay and before the quilting contours were added. And a peek at the foundation pieces before wool roving and lots more of scattered bits became a part of it. I may try making another quilt of this particular view before moving on. I'm pleased with the results of these first two. However, it's not my intention to have to add so many other mediums to get them to the point of liking them. It's all serendipity plus a bit of experience that may get the results in the way I desire ... allowing the fabric to have the strongest voice. There just may be a Smoky Mountain series in my near future. If so, here's number one. This photo taken a few falls ago was my reference. I ended up dumping all my scraps out of their bags to find large enough pieces of browns, purples, and greens. That mess is still on the floor here in my Michigan studio. The sky is a major element, as well as being the most distant in this composition, so it was arranged first. For the first time I placed a piece of light blue tulle over the sky fabric pieces and roving before I continued with building the mountains. My purpose was to keep them from migrating down into the mountain area. Mmmmm...I'll have to keep this in mind for a misty (smoky) horizon in future pieces. You'll notice the fabrics are not ironed. 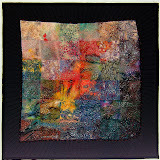 I like the texture that wrinkled fabrics lend to the work. My next step was to scatter bits and pieces to represent the trees on the distant mountains and then I added wisps of wool roving to the foreground trees. Another layer of light blue tulle to hold all the layers in place evened out the effects. 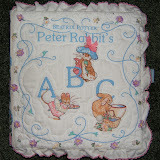 The quilting patterns added details, but when that was done the piece had lost its "sunshine". I wish a photo had been taken then, but I couldn't wait to get at it with watercolor pencils and oil stick pastels to get light and shadows in there to more clearly define the distances between the foreground stand of trees and the distant mountains. For a time, I was afraid it had been overworked. I'll try to keep this in mind when choosing and layering the fabrics in future mountain pieces. As I recall, this is very much how I felt about Lake #1 ... overly done to make it work. 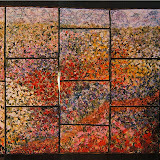 The border is made from the leftover pieces I had created to frame "Regeneration". I like the way this type of border looks with the mountain theme. It's the same type that borders the "Bear Lake" quilt. The next time I create one, I'll take step-by-step photos for a tutorial. There will be lots of photos taken in those mountains when we get back to Tennessee in a month. In the meantime, I intend to "play" with a few more pictures I already have in my archives. mmmm...wonder where this creative adventure will go. While the after effects of Ike weather was storming over the lake this past weekend I felt compelled to create colorful lake pieces. 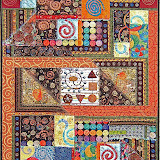 How the layered piece looks after the rows of machine quilting stitches are added always amazes me. Here's the before with the layer of tulle laid on top. That purple and orange sunset lake piece lead to another. 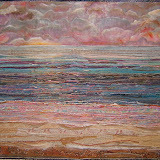 ...and how it appeared before the quilting defined the clouds, waves, and patterns in the sand. The first two are definitely sunsets. Monday morning we awoke to pink tinged clouds at sunrise which sparked this one. 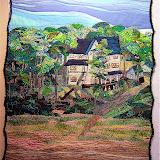 ...and its appearance before I quilted it. Since demonstrating the technique I use to construct the lake quilts in my series to 100 at Good Good's gallery, I've been concentrating on making more. The one above was created the second day, Sunday, at the Gallery. Here's how it looked when I brought it home to quilt. It represents the beautiful, clear, and warm days at the end of August here in Michigan before the effects of Hurricane Ike reached us. I made six small quilts that looked stormy. 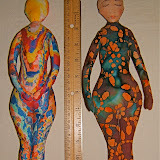 They began as one very long piece ... the width of my work table. When I began the quilting process there was a problem with the "orts" shifting under the tulle netting, so I cut it into more manageable pieces. Four of the small 5"x 8" quilts were presented to the gallery ladies at Good Goods in appreciation of the work they did in the wonderful presentation of my quilts. Those pictured below were gifted to two young families to commemorate their visit here at the cottage during a very wet and stormy weekend. I don't consider the small sized lake pieces to be an official count in the series. They get a decimal point designation after the number of the larger one just finished. Three more birds have been added to the growing flock out there in the world by me. I created one from zebra and leopard print fabrics as a house gift for a friend. She has lived in Africa and this one, complete with a mane-like headdress, blends in with her decor. The other one was made for Bev in appreciation for her sending me the raveled threads that result from washing and drying her hand-dyed fabrics as well as some dyed cheese clothe and fat quarters of that dyed fabric. Her fabrics made a beautiful bird. I took a cue from my friend, Alicia, and glued the feet of the zebra bird to a rock and the Bev's to a piece of drift wood ... both of which were found on the beach. Here's a photo of Alicia's flock perched on her back fence in Milwaukee. A few of them are standing on shells while others are on rocks and pieces of driftwood. Speaking of Alicia, she had given me yards of a wonderfully wild fabric that I challenged her and another friend, Helen, to use in these birds when we got together a few weeks ago. Helen gifted me with a nest. Her bird with the challenge fabric used in the body is on the left, Alicia used that fabric for her birds underbody who is in the nest, and mine with that fabric as the wings is on the right. This one was the first to get a fancy yarn headdress. Three lengths of yarn are glued along the seam on top of their heads. PS: To see a collection of photos of my birds and those of my friends go here. 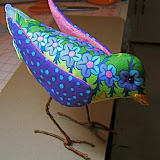 PPS: If you've made a bird from my pattern I'd like to see it. Send me a link or email a photo to me (find email address in my Profile). I'll post your photo in my Picasa album if you give permission. 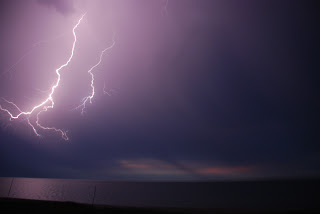 Mother nature produces some magnificent light shows in numerous night storms over Lake Michigan, especially in the month of June earlier this summer (go here to read a bit about some of those storms). During the first of those that we experienced, my older son and I got caught on the beach. A great amount of rain had fallen and made large puddles on the beach. Thinking the storm was over, we went to check them out and got caught there by lightening from another storm. It was very scary to run and crouch every five feet till we were off the beach ... soaking wet and shaking, but safe. I knew right then there were quilts about lightning storms at night in my near future. The first one (#58) was presented to that adventurous son on his 42nd birthday last week. It was a challenge to capture the quality of night let alone lightening bolts. However, by the time this one was finished, I was ready to make more. This next one (#61) I thought to stop long enough to take pictures during the construction process. The first layer in all the lake quilts is made up of larger scrap pieces. I chose dark valued ones for a night storm. That layer get a spritz of temporary adhesive to hold the small fabric bits and threads in place. A metalic silver fabric was cut in slivers to portray the bolts of lightening and their reflections in the water. 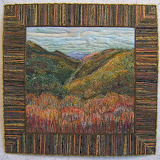 Dark colored wool roving helps to obscure some details while light value roving colors and highlights the clouds. All these night storm pieces are finished with a layer of black tulle netting. 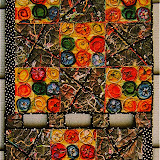 This is the piece that was used to demonstrate my quilting techniques at Good Good's gallery last Saturday. I took a break from the night storm pieces to make this large one that represents the kind of days we had the last week of August. Good Good's show cased this one at their entry door on the street level (the gallery is upstairs). 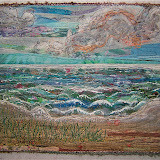 To view and read about lake quilts featuring stormy daytime weather so here and here. Creating several lake quilts at Good Good's gallery in Saugatuck, Michigan this past weekend was fun. I was scheduled only for Saturday, but ended up there on Sunday afternoon as well. Many people, both local and vacationers from surrounding states, came to watch the construction and stuck around to talk about quilts, quilting, and art. I was most pleased that Kay ("Out of the Basement" blog) drove up from Indiana to see my work in person. We have been emailing and reading each others blogs for several years and it felt as though I was greeting a long time friend even though we were meeting for the first time. This "after the sun has gone down" piece was begun and completed Saturday afternoon. The previously constructed lake piece that I had taken to demonstrate my quilting and couching techniques will be posted soon. It's one of three that represent the night storms in June.